Arthur Nash posted the image below on his Facebook page: New York City Gangland - Rare Photo Book. He is the author of New York City Gangland, a compilation of some 200 rare photos of mobsters obtained primarily from private collections and law enforcement sources. Mob figures included go all the way back to Prohibition Days, but the book also includes contemporary gangsters, such as John Gotti. 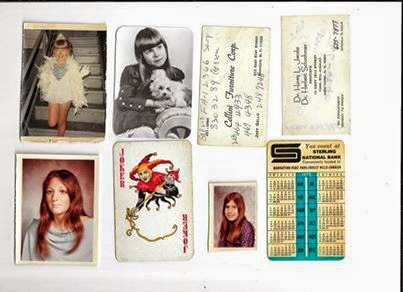 This images features items found in Joe Gallo's wallet after he was shot to death in Little Italy. Crazy Joe Gallo died on the night of his 43rd birthday, on April 7, 1972. Gallo had spent the evening celebrating at the Copacabana nightclub, then he and a few others stopped at Umberto’s Clam House on Mulberry Street in Little Italy. It was around 5 a.m.
A short while later, shooters materialized at the restaurant and fired a volley of shots; Gallo staggered out of the eatery and fell dead in the street. Apparently Gallo thought he was safe because there supposedly had been an unwritten agreement among gangsters that Little Italy was off-limits to bloodshed. The Gallo murder, like Joe Colombo's, was never solved; although there theories abound. Today, the Italian restaurant Da Gennaro is in the space formerly occupied by Umberto's Clam House, which re-opened in another location down the street, on the corner of Broome and Mulberry Streets in ever-shrinking "Littler Italy." 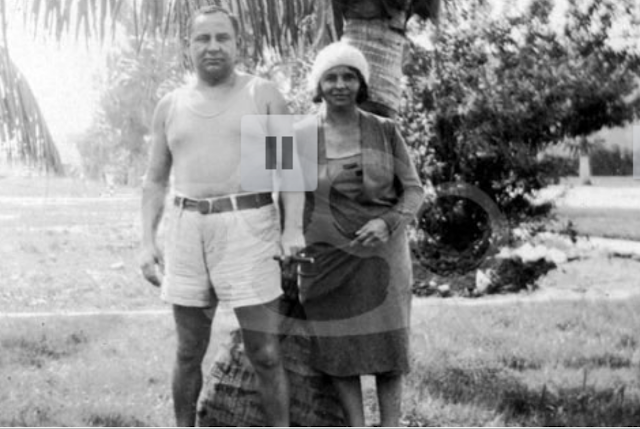 On the New York City Gangland book website, there's a great preview that includes a b&w photo taken circa-March 1930 of Joe "The Boss" Masseria while vacationing in Florida with his wife and a member of his crew. In the photo, below, Joe and the wife are standing under a palm tree; he's wearing something like a smile on his face -- as well as a wife-beater, shorts, and shoes with no socks. He has the stance of a brawler. The caption says that Masseria's chief lieutenant had made that particular trip to Florida with "The Boss" and his wife; that guy was Salvatore "Lucky" Luciano, and for all we know, Luciano could've been the one who took the picture. The caption also says both Joe and Lucky were arrested for patronizing a gambling hall that occupied an entire floor of a Miami resort hotel. There are other photos too, including an undated image of Al Capone, probably also at a Miami resort. He's wearing a classic Jantzen "swimming suit" popular back in the 1920s -- and it's riding high, well above the waist, probably to hide a paunch. Who did he think he was fooling? He's also holding a young boy, his deaf son, perhaps?